Indian boxers continued their 100 percent strike rate at the AIBA Asian Olympic Qualifying Event in Astana, Kazakhstan with Beijing Olympics bronze medallist Vijender Singh (75kg) easing through to the quarter-finals with an astounding victory against Ishak Waez of Syria. The former world number one made an aggressive start not wasting any time. The opening three minutes of play saw him take the upper hand with his swift footwork and sharp blows ? he would hit and withdraw quickly, not giving his opponent a chance to counter attack. The Veteran boxer made good use of his experience, not allowing Ishak to play his natural game. He was leading 5:1 by the end of the opening three minutes of action. In the second round and the Asian Games gold medallist almost knocked the lights out of the Syrian boxer, with a massive uppercut. Ishak who was left rocking after that cracking blow, was lucky not to get a count from the referee. 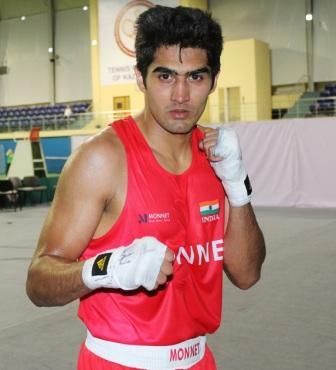 Vijender the 2009 World Championship bronze medallist went on to win the second round 4:2 and the bout 11:5 in the end. The 26 year old is now one win away from securing an Olympic berth. In the quarter-finals of the middle weight division he lock horns with 2011 Asian Championship silver medallist Chuluuntumur Tumurkhyag of Mongolia, on Sunday 8th of Apr. IABF Secretary General, Brig PK Muralidharan Raja was extremely pleased with the performance of the Indian boxers and stated, ?It is an ideal start made by the Indian team, with a 100 percent strike rate till now. A good opening always does wonders to a team?s as well as individual confidence. Our boys are in good form and ready to take on tougher opponents?. Earlier in the day Asian Games silver medallist Manpreet Singh (91kg) started his campaign in Astana with a knockout performance to advance to the quarter-finals stage of the heavy weight division. The Indian boxer was at his menacing best as he devoured his opponent Yerbolat Tulyek of Mongolia in less than two minutes. Manpreet will now meet Borbashev Chingis of Kyrgyzstan in the quarterfinals on Sunday (8th April). Incidentally the Kyrgyz boxer created an upset by defeating Rustam Tulaganov of Uzbekistan in the other pre-quarterfinal bout today. The four time national champion would have to be the last man standing in the heavy weight division to win the lone quota place on offer in his weight. Day three of the qualification tournament will witness two Indian boxer take to the ring in their pre-quarter final bouts. Commonwealth Games Gold medallist Suranjoy Singh (52kg) will face off against his old nemesis Nyambayar Tugstsogt of Mongolia in the 52 kilograms weight division, while Youth Olympic Games 2010 Silver medallist Shiva Thapa (56kgs) go against Mohd Nooristani of Afghanistan.